This simple dish is ideal for lunch. And yes, you really do need all that lemon juice! Serves 4. 1. Peel the potatoes and cut into chunky dice. Place them in a serving dish. 2. Make tahini sauce by mixing the tahini with garlic, lemon juice, water, paprika and seasoning. Combine well until the mixture becomes smooth and creamy. 3. 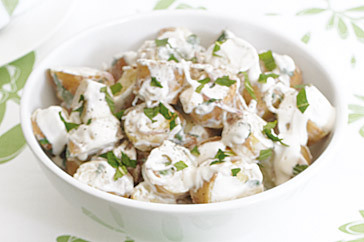 Pour the sauce over the potatoes, and garnish with parsley. 4. Serve with pitta and a big bowl of salad.